ANTI – SEMITISM! That word strikes stark terror into the hearts and minds of many people. 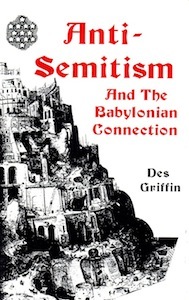 Most will go to great lengths to avoid being smeared as “anti-Semitic.” D. Griffin asks many questions: What is anti-Semitism? Where did the word originate? Is asking any questions regarding the Jews worthy of being ostracized, socially, as anti-Semitic? Are all Jews of Hebrew extraction? Who is a Semite – are Jews, what about Arabs? Is God anti-Semitic? Is Jesus anti-Semitic? Who are the mysterious Khazars who make up 80% of Jewry? What does the “Babylonian Talmud”, the ‘ultimate authority’ in Orthodox Judaism, teach regarding Jesus Christ? What is the ‘Kol Nidre’(All Vows) prayer, does it give Jews license to break any and all oaths with impunity during the following year? Des Griffin believes that all these questions should be addressed honestly and freely in an open forum. Packed with thoroughly documented facts this book may be one of the most challenging you will ever read.